Dill Shrimp Appetizer - Home. Made. Interest. 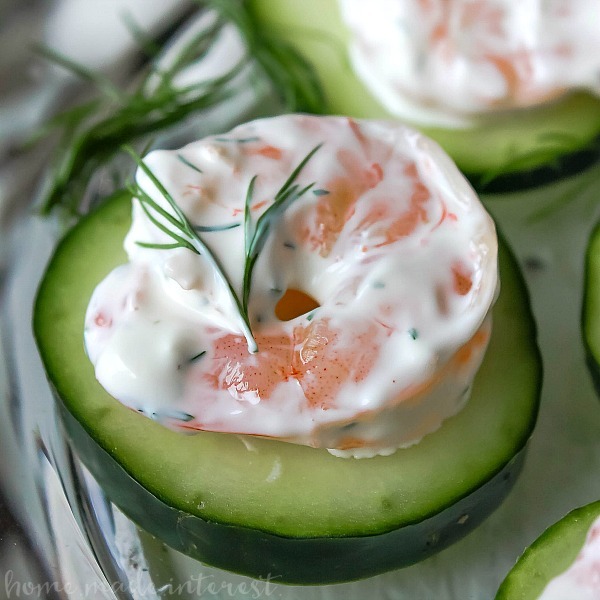 This beautiful Dill Shrimp Appetizer is a light, fresh, and easy low carb appetizer recipe made with shrimp tossed in a creamy dill sauce served on a crisp cucumber slice. This Dill Shrimp Appetizer recipe is the perfect appetizer for a party. It is simple, elegant, light appetizer that you can serve at a brunch or a dinner party. 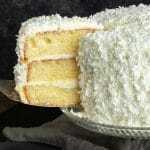 It’s great for feeding a group of people because it is gluten-free and low carb! All of the flavor in this delicious shrimp appetizer comes from the sauce. It’s a mixture of sour cream, mayonnaise, fresh dill, lemon zest, and a pinch of salt. If you can make the sauce the night before the flavors really come together and the dill adds this light, fresh, taste to the shrimp. You can steam the shrimp the day before too and add it to the sauce to let it marinate over night. That gives you the most bang for your buck when it comes to flavor AND let’s face it, nothing is better than a brunch recipe you can make ahead of time because seriously, who wants to be up at 5am cooking ?! You can serve these shrimp on toast points, crostini, pita bread, or even crackers but my favorite way to eat them is on a cucumber slice. 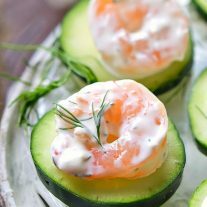 The light taste of the cucumber doesn’t get in the way of the bright, fresh flavors of the dill shrimp and it has a nice crispness to it that I just love. 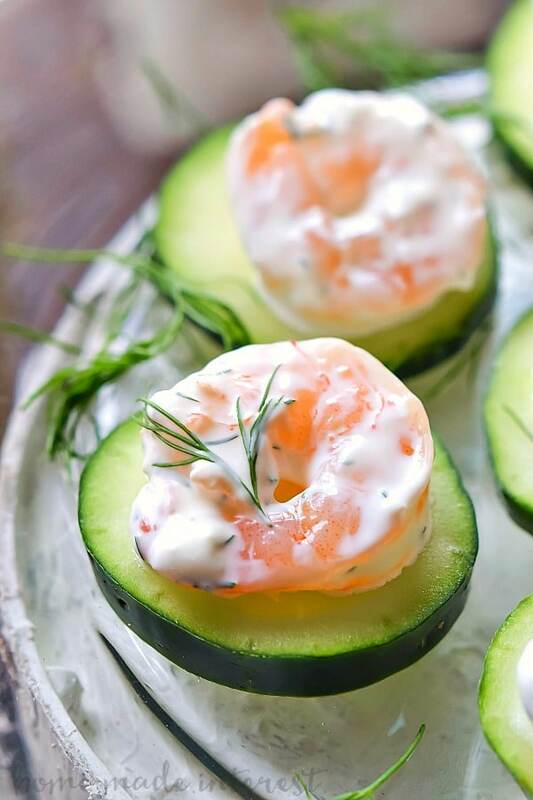 Serving the shrimp on cucumber slices also makes this a low carb appetizer. Make the sauce the night before and toss the shrimp in it. That gives the shrimp time to take on the flavor overnight. If you’re serving it on cucumbers add a little pinch of salt to the cucumber slice before placing the shrimp on it. If you want to make the recipe even lighter you can skip the sour cream and mayo and substitute Greek yogurt instead. 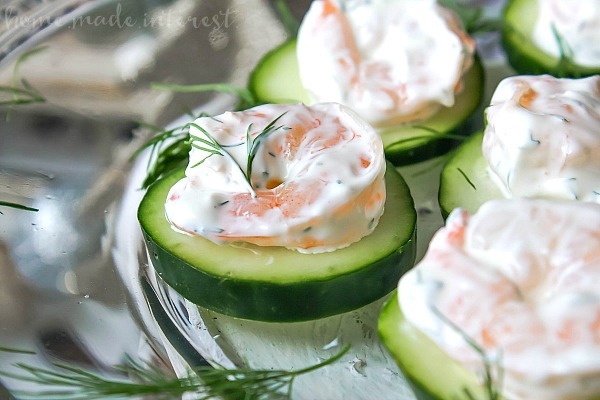 This Shrimp and Dill Appetizer is a healthy appetizer recipe that is quick and easy to make. Bring a pot with a small amount of water to a boil. Place shrimp in a steaming basket and place it in the pot. Steam shrimp for about 5 minutes or until fully cooked. Remove shrimp from pot and let cool. In a large bowl with an airtight lid mix together the sour cream, mayonnaise, dill, lemon zest, and salt. Add shrimp to the sauce and toss until throughly covered. Place the lid on the bowl and store in the refrigerator for at least 1 hour (overnight is best if possible). Slice up cucumbers and when ready to serve place one shrimp on each cucumber. Note: We are not certified nutritionists. These nutritional values were calculated using MyFitnessPal.com. Love that idea I’m going to try that next time.